Tmobile - free European data plan is not too shabby! Tmobile – free European data plan is not too shabby! June 2017 – T-mobile’s European free unlimited data speed test is shown below. Not too bad. 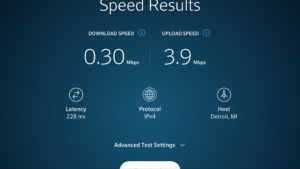 The test was performed in Germany and my phone shows an LTE connection. They say you’ll get 3G speeds in 140 countries and as you can see this is about what I got but it seems to be a lot faster than good old 3G. You will also have to have a compatible phone obviously with to the mobile you have a GSM enabled phone. Also I am using the latest and greatest iPhone 2016 model 7+, an older phone might not be as snappy. Of course, where they will really get you is the $.20 per minute incoming call fee – a simple work around i.e. turning on call forwarding before you leave the USA – call forwarding to something like a Google voice number – will help alleviate this problem. Search the inter-webs and you will find stories of folks who have got caught by five dollar per megabyte data fees, ouch, thousand dollar phone bills, ouch again, so do your homework before you leave. When I first looked into T-Mobile’s unlimited European data plan I scoffed at it but having used it for the past week I must say it’s pretty useful, you don’t have to swap out the Sim card for a local European cell phone company, you don’t have to port forward your telephone number, and you can mostly use your phone like you did minus the voice calling part – at a pinch it’s only $.20 a minute not crazy but still wise to avoid. Next Next post: City Car – VW Up! WTF!